We were called in to advise a large government facility on a poorly performing condenser (tower) water system. At that point in time we noted that there was no filtration on the system. We found that the risers and other system piping had a fair degree of scale throughout the system that consisted mainly of iron oxides combined with hardness minerals and some organic material. The system had to date been fed chemical treatments to the tower sump by hand. 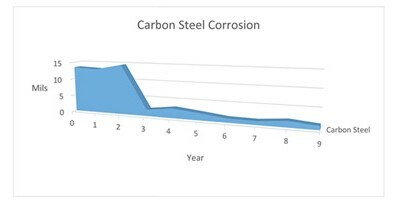 Given the existing conditions in order to bring the system into control, it was decided that the best approach was to use a molybdenum based product containing a carboxylated terpolymer to help penetrate the scale, passivate corrosion, and slowly break up the scale into a fine material that could be removed through bleed-off and flushing. This product also contained an azole for yellow metal passivation and a blend of polymer dispersants. Eventually a high efficiency, mixed bed sand filtration system was installed to help clear up any new ultrafine airborne debris as well as old corrosion by-products. 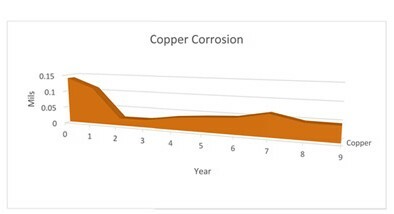 Our formulated inhibitor product has performed very well for many years now, as our corrosion charts indicate. Additionally, we were asked to evaluate the cooling tower biocide program. From monitoring tests on the (bacteria) microbe levels in the cooling tower, it was concluded that the tower needed a biocide program that would be more effective against sessile species. This would cause the tower to operate more efficiently, avoid unnecessary corrosion and most importantly, reduce the chance for developing Legionella Pneumophila. After evaluating the efficacy of the biocides that were being used, we decided to implement a new biocide program that consisted of a THPS based biocide/dispersant product and a Quaternary Ammonium Compound. Testing for anaerobic bacteria species had shown that the dispersant in our THPS was very effective at moving sessile species off the surfaces and into the bulk water where the THPS can have a more effective kill. Unlike other oxidizing products, our product did not increase corrosion rates or cause problems such as breaking up scale and deposits in large particles which can interfer with isolation valve operation. Our Quaternary Ammonium Compound has shown itself to be a steady and reliable biocide product that has broad spectrum capabilities. In addition to introducing the 2 new biocides, we upgraded the chemical feed and monitoring systems to better control and maintain product levels. This upgrade included an internet capable controller that keeps and shares data logs which enhance monitoring and reporting.